‘Hollywood History’ is all the rage these days, but it comes at a huge cost – to reality. One of the most pervasive trends in 21st century western culture has become somewhat of an obsession in America. It’s called “Hollywood history”, where the corporate studio machines in Los Angeles spend hundreds of millions of dollars in order to craft and precisely tailor historical events to suit the prevailing political paradigm. ‘Hollywood history’ is very much in fashion these days. From Lincoln to Dubya, and from Blackhawk Down to The Iron Lady, they constitute a significant portion of today’s major releases. That list keeps growing every year. There’s only one problem however, with tailoring a story to fit neatly into a prevailing political paradigm… and over the last 100 years, the Germans and the Soviets did this too – with devastating effect, but back then they just called it propaganda. These highly scripted narratives are what passes for official history these days. No film embodies the Hollywood historical treatment more than the much celebrated cinema release of Zero Dark Thirty, directed by Kathryn Bigelow, and one of the favourites to grab an armful of Academy Awards this weekend in LA including Best Picture, Bigelow for best director, Mark Boal for best screenplay, and Jessica Chastain for Best Actress. It’s a great piece of Pentagon propaganda. Where this film starts to take on heat is with its sensational on-screen CIA torture scenes. Unlike previous less celebrated, but more integral and intellectual cinematic efforts like Rendition and Lions for Lambs, Bigelow’s portrayal of torture is hell-bent on going the distance to glorify (through her attempt at Cinéma vérité) the troubling practice of torture by the CIA – as a means to glean intelligence about the whereabouts of various Islamic terrorists scattered throughout the world’s third world cesspits. By definition, this is pure propaganda. The film has a simple, sole purpose: to propagate a government-founded, false premise that, ‘torture is necessary to keep America safe’. 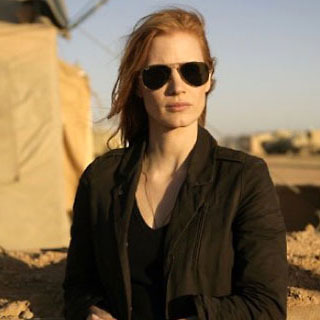 COOL LIES: Actor Jessica Chastain unaware that that ‘Zero Dark Thirty’ was a work of total fiction. In fact, the US Senate Intelligence Committee spent four years investigating the CIA’s torture program, and according to Senators Diane Feinstein and John McCain, the CIA’s vaunted torture program under Obama did not lead to bin Laden (that’s the only true statement you will ever hear surrounding the government’s Osama bin Laden tale). One thing was clear when watching this film, and also by the reactions of theatre goers at my screening in Brixton, South London, that Zero Dark marks a new low point in America’s now fashionable politicised culture, and Bigelow must be aware of this because she seemed to play this card shamelessly in her highly politicised film. Never before in the history of cinema has there been such a break-neck rush to complete and release a motion picture so soon after the said event, to serialise the legendary “Hunt for Bin Laden”, and “the greatest manhunt in history” by a gallant Seal Team 6, ending in the siege of the terror kingpin’s alleged place of abode – a compound located in Abbotabad, Pakistan. Apparently, Bigelow’s production was already in motion in May 2011 in advance of the White House’s announcement that Seal Team 6 had killed Bin Laden, and Bigelow it seems, was either persuaded or herself decided (it’s not clear which one it was), to rewrite the film’s script in order to theatrically chronicle what President Obama had put forward as his greatest achievement since taking office. This was the birth of Zero Dark Thirty. Others are investigating whether the movie’s filmmakers received quiet government funding to promote torture, since they did obtain classified information, according to many reports. Unfortunately for Bigelow, and as some of us learned with Iraq, so-called ‘classified’ information is only as credible as its source (US intelligence unfortunately has a spotty record of late). Was bin Laden really killed by Seal Team 6 that day? Examine the evidence, if you can find any. Hitler’s Reich relied on talent filmmakers like Leni Riefenstahl, to write the government’s version of Nazi history. If Pentagon propaganda, or bolstering President Obama’s political trophy were the motives, then one could compare this film’s creators to similarly well-paid cinematic forebears like Albert Speer, or Leni Riefenstahl. Female cinematic icon Riefenstahl’s involvement in crafting Nazi government propaganda was eventually her undoing. After the Reich fell in 1945, she still maintained that her films were ‘works of art’ and claimed that they had nothing to do with Nazi politics and propaganda. With all the lies and propaganda swirling around Washington’s own criminal class, it will be interesting to see how filmmakers like Bigelow will defend their own ‘art’ in years to come. But it’s hardly the first time Hollywood has been accused of gross misuse of its creative license. It’s become the norm, rather than the exception. Other Hollywood attempts to hold the government’s line on history include the box office debacle, Flight 93, which derived its plot, characters and production design solely from the federal government’s own Official 9/11 Report, and added the usual Hollywood embellishments. Evidence fleshed out since points to the obvious scenario that Flight 93 was actually shot down by a US jet fighter, with left the plane’s debris spread over 20 miles in and around Shanksville, PA on Sept. 11, 2001. No matter, Hollywood kept to the government’s original outdated script of “let’s roll!”. The sheer volume of mistruths which have been fed downwards by the US government and its corporate media apologists over the last decade is staggering, and has had quite of profound, polarising effect on media consumers North America and Western Europe. The avalanche of state-sponsored and corporation-sponsored propaganda over the last decade in particular, appears to have successfully divided society into two groups: those who believe official propaganda and government released narratives of major events – and those who question it. It’s safe to say that the sort of people who would never admit in public to questioning the government’s official explanations about what happened on 9/11 – are generally the same section of the population who would accept a film like Zero Dark Thirty as recorded history. These might also be the same type of people who believed in advance of America’s bombing and invasion of Iraq – Saddam Hussein had weapons of mass destruction. The bin Laden mythology is powerful, however, and millions of people will walk away from this film feeling as if they’ve learned something about what its like working in gritty side the CIA. Under normal circumstances, I would not pay for a ticket to see a historical production which I believe was based on a fictional narrative. I made an exception in this case because it was the only way I could review the film in time to write this piece. But the most profound realisation I got whilst watching the movie was a very sad one. I felt sorry for the director, the cast and all the production crew who put in their hard work and sweat, and probably believed that bin Laden was indeed in the Abbotabad compound in May 2011, and that they were reenacting a rare and proud piece of American history. In order to believe this, they would also would have to have believed that somehow, that same bin Laden also masterminded a multi-pronged assault that managed to bypass the whole of the US Defense apparatus – all from his legendary cave in Tora Bora. It’s no surprise how much both the Bush and Obama governments and the corporate military industrial complex has benefited from maintaining the mythology of a living Osama bin Laden since 2001. Unfortunately, the mythology does not measure up to reality, with multiple admissions in public by heads of state by Pervez Musharraf, and Benazir Bhutto, as well as by Madeline Albright and others, and even mainstream media reports going all the way back to 2001, stating that Osama bin Laden was dying, or had in fact died in late 2001. Knowing all this, when I heard the news of Obama and the Navy Seal Team 6 raid on bin Laden, I knew immediately that not only was this almost certainly a fiction, but that there would be no photographs and videos released, because a dead man cannot come back to life after 10 years for a photo session. On top of this, we were also told that the US Navy had dumped bin Laden’s body at sea 48 hours after allegedly killing him. Fancy that? But even that pillar of the official fell apart later when it was revealed that no US sailors aboard the USS Carl Vinson ever saw the alleged burial at sea, and that no images exist in any government records of bin Laden aboard the decorated US sea vessel. Hard to believe, but only if you believe the government’s official fiction on the fate of Osama bin Laden. Also, unknown to Kathryn Bigelow and her crew at the time of production, there was no DNA identification of bin Laden by the Pentagon either, and no autopsy was done. It’s as if he was merely a ghost. Does that mean that White House announcements to the contrary back in May 2011 were lies? Yes, it does. So let’s get that straight. There no evidence to prove that bin Laden was even there at Abbotabad in May 2011 (or alive for that matter), and Zero Dark Thirty is based on the idea that he was there because the CIA said he was. We can imagine Albert and Leni getting excited right about now. These facts certainly give my own statements on the incident even more credibility, but that’s nothing to cheer about. We were lied to, again. Zero Dark is also flanked this year by another historical effort which has relied heavy on Hollywood brand of artistic license is Ben Affleck’s Iranian hostage drama, Argo, which most analysts agree was heavily padded with imaginative characters, written-in backstories and invented obstacles, all woven together to create an ‘interesting’ and entertaining piece of film much the same way Charlie Wilson’s War was a jovial depiction of the CIA’s gun-running in the Soviet-Afghan War, painted by Hollywood as a story of American heroism for the ages. There are literally dozens of other examples of invented Hollywood history, these are only a few. Rarely is ever – has Hollywood ever actually challenged the political paradigm or the power of the Pentagon in one of its ‘historical productions’. Argo and Charlie Wilson’s ‘semi-fictional’ genre might seem like harmless Hollywood’s ‘tinkering with history’ to many movie goers, but altering history for entertainment purposes is not just deceptive, besides the fact that it’s not true yet its being passed off as history, it’s also heavily politicised cinema propaganda, and borders on mass brain washing, further distorting generational truths about what our nations’ governments actually get up to on tax payers’ time. Rather than betting the farm on a quirky piece of historical trivia, will film goers ever see the day that a director like Affleck might try to tackle the Iran Contra Scandal and the CIA trading guns to Nicaragua in exchange for cocaine flown into smaller Baton Rouge, Louisiana and Mena, Arkansas airports? Or reveal how the same CIA, with the help of the FBI, being responsible for introducing crack cocaine to the streets of Los Angeles during the 1980’s, or even about the CIA shipping heroin out of Afghanistan after 2001? Likewise, ignoring the true historical context that it was the very same CIA, with the help of Saudi oil money, who created and trained the present day al Qaeda by employing the likes of Osama bin Laden to handle the terror group’s finances over the decades. Sadly, spending $150 million on a film production that could reveal actual history, and out govt corruption – is probably asking too much from Hollywood’s bold and beautiful. No, no, stick to quirky revisions of history, non-events, or outright inventions, and then bask in all the pomp of Oscar night. Perhaps, upon doing a little research, Kathryn Bigelow might consider doing a sequel to Zero Dark Thirty – and tell us what happened to that famous “Navy Seal Team 6” after the bin Laden raid. That would make a good story, and one many people would like to know more about. In the end, Zero Dark can only be summed up as one big, expensive lie in celluloid, in the Riefenstahl and Speer tradition. Regardless of how many awards it wins this winter – that’s how history will eventually label Kathryn Bigelow’s latest piece of moving art. The good news is the truth has no expiration date, and political propaganda eventually collapses under the weight of its own inflated sense of purpose. All we are seeing here, is simply… Hollywood drifting further towards Washington DC.